Are you curious how cool you look using your Leica? Rear view mirror allows you to watch yourself taking photos behind the viewfinder. See what others see. Also usable to scan rearview for possible photos. Mounts to any hotshoe. Gain instant respect as onlookers gawk at your camera's battle scars. Our professionally trained team of technicians takes any Leica and adds carefully calculated splotches of black and brassing to the body. Lens painting not included. Not available for chrome users. Allow 3 to 4 weeks turnaround. Early morning shoots in cold weather are no problem with this ice scraper designed to fit any Leica lens. 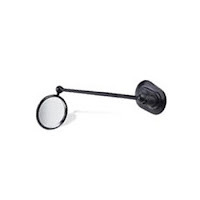 Also usable on viewfinder, eyeglasses, or rearview mirror. Fits easily in hotshoe for storage. Note: Noctilux owners please order XL size. Say goodbye to thumb and forefinger strain with this custom winding thimble. Two separate models designed for finger or thumb. May be used to advance film also. Available in blue (shown), yellow, red, green, or Leica black. Two tiered trophy with screw mount acme can be used as tripod in the field or as showpiece above the mantle. Either situation lends a touch of class to your next Leica outing. 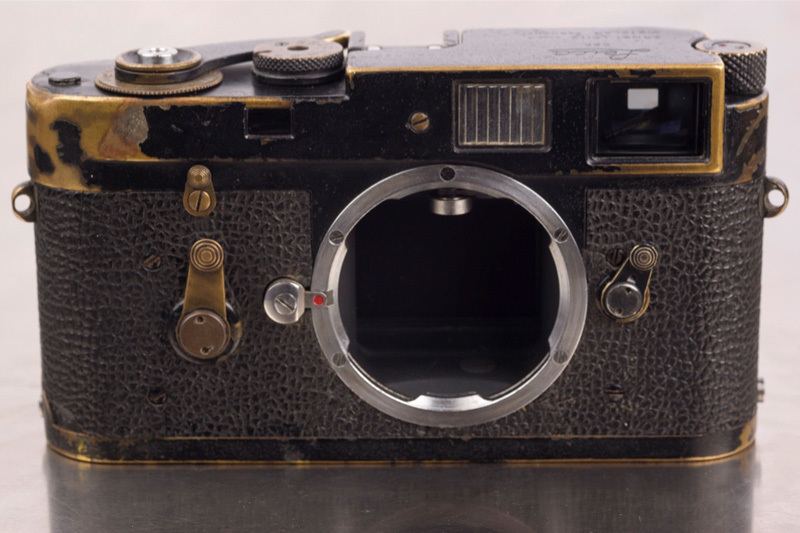 Converts any Leica into an award winning camera. Telescoping legs allow easy transport and storage. Available in blue, red, or gold, or distressed brass. Leave your Leica secure at home while this plastic placebo takes its place around your neck. Take a load off your mind as you drop, scrape, leave in gym locker, or abuse in any way while your real Leica remains safely stored in the location of your choice. Note: not usable for actual photography. Whether capturing dramatic scenes in a war zone or the ghetto, truck nuts speak the universal language that says you mean business. Made in the USA of cold-forged steel, truck nuts lend machismo to even the sissiest Leica. Simple bolt attachment screw mounts to any tripod hole. Love this. But the prices are way too low. 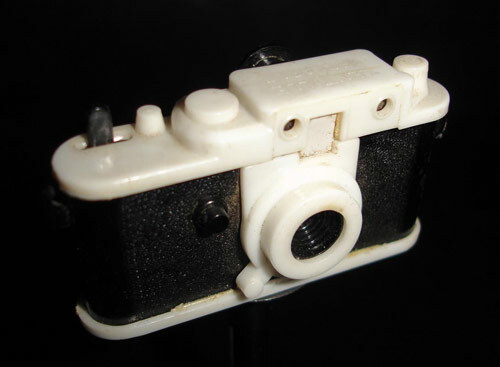 For even the smallest piece of plastic, if it's got the Leica name on it, it's got to be over $100 at least. I own a M9. The "CUSTOM DISTRESS PAINT JOB" is standard ;-) Nevertheless for all other M's a nice gift. I don't know how common truck nuts are in other locales but I see them fairly often here in rural Oregon. Cowboys take their manhood seriously. Noncowboys too. Haven't seen any on a Leica though...yet. In the interest of full disclosure I am a Leica owner. I just like to poke fun at the whole phenomenon. 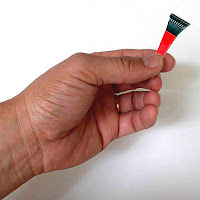 The WINDING THIMBLE is a great idea. By the way it reminds me that I lost the habit of clicking with the thumb now that I use a chunky modern DSLR. Before that I had a Nikon F3 (still have it) and had the habit to click with the thumb... don't know why, but I liked it. I guess it is a crucial Poll question: Do you click with the thumb or the 1st finger ? Now I forgot about advancing film. Well, I know I used my thumb too but can't figure out if you can do otherwise. 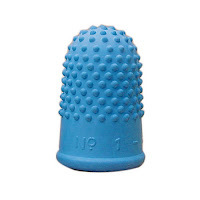 There was some confusion on HCSP about the winding thimble too. As the name implies, it's meant to aid Winding, not shutter-pushing. I'm sure anyone who's put several rolls through an M6 over a compressed time period can relate to the acute pain that develops in the inner pad of the left hand thumb and forefinger where they clutch the tiny wheel at the end of the rewind lever. That pain, and the idea of a thimble to prevent it, was the initial idea in this list. I've never tried pushing the shutter with my thumb although I guess in that case a thimble might come in handy. Here in Austin I see my fair share of trucknuts, and I bet in "real" Texas there are many more per capita. My favorite (the ones I hate most) are purple. They somehow look like balls in a condom. Just awful. I've just boutght a late serial number single stroke M3, so I'll be needing a Rear View Mirror and some Truck Nuts thanks. Are you left handed, or, are you rewinding in some really odd way? Darn I should have insisted on royalties when they took that cast impression of my "nuts". Could have retired. I never realized my winding method was strange. I hold the body in my right hand and rotate the lever with my left. Maybe others do it differently? Ha! Funny. But where can i get the nuts?